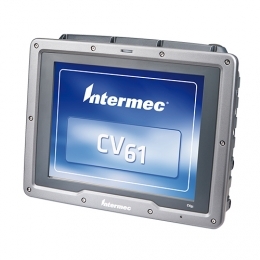 The CV61 computer terminal from Intermec was specially developed for vehicle mounting. It masters current and future challenges with ease. You realize flexible hardware and software expansions with the CV61 effortlessly. Equipped with a powerful Intel Atom processor with 1.8 GHz and up to 3 GB RAM, the CV61 offers a reliable base for every computer system and demanding applications. Users increase their efficiency with the help of contactless voice control and complete wireless connectivity via Bluetooth and n-standard Wi-Fi. In case of a problem, the 12.1 30.7 cm touch display is exchangeable directly on-site. It shines brilliantly in dim warehouses just as well as in bright daylight 500 Nits and a brightness sensor ensure for optimal readability at all times. The high degree of robustness guarantees long periods of uninterrupted operation. Its housing complies with IP66 protection standards against water and other foreign particles, and is additionally impact and vibration-resistant MIL-STD-810F. For reliable operation in cold storage areas, optionally expand the CV61 to include an integrated heater. Select Product * Please select product Intermec CV61A, USB, RS232, BT, Ethernet, Wi-Fi, PS/2, disp. Intermec CV61A, USB, RS232, BT, Ethernet, Wi-Fi, PS/2, disp.